500,000+ 5 Star reviews. On all orders to the UK Mainland. Top brands at low prices. Range of tools including top brands. 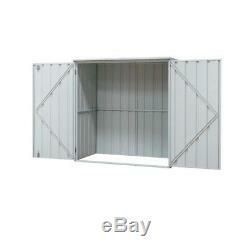 Sealey Galvanized Metal Steel Tool Garden Bike Shed GSS150815 1.5 x 0.8 x 1.5mtr. Black Decker RS890K Autoselect Scorpion Saw Recip Jigsaw 500W Cased RS890K-GB. Sealey Galvanized Metal Steel Tool Garden Bike Shed GSS150815 1.5 x 0.8 x 1.5mtr Stock Code: GSS150815 This is a handy easy to construct small tool or bike shed. Perfect for storing garden tools, lawnmowers, kids toys, bicycles and more when space is at a premium. Also supplied with a bolt down kit for extra security when erected on concrete. Galvanized steel panels easily screw and rivet together to form a rigid and secure structure. Double door fitted with cross bolt and eyelet that accepts padlock (not included) for additional security. Supplied with bolt down kit for secure fixing. Specifications of the Sealey GSS150815 Model No: GSS150815 Colour: Silver Roof Type: Flat Doors: 2 Overall Size (W x D x H): 1500 x 800 x 1500mm. This is a handy easy to construct small tool or bike shed. Our carriers apply a surcharge to certain UK Islands, Northern Ireland and the Scottish Islands, unfortunately we have to pass this charge on to our customers. Whilst we do not want to pass on surcharges to our customers we are unable to absorb the full cost of sending to these orders. Once you inform a member our team, you can then return the parcel within 30 days of receiving the goods. This is under the following conditions. Carriage charges for returning unwanted parcels or items ordered in error are at your expense, we cannot be held responsible for this. Please use a traceable service, otherwise there is a possibility the courier could misdeliver your goods and your parcel will not be relocated. We cannot be responsible for which courier you choose to return any items back with. Emailing us that you wish to cancel your order does NOT guarantee its cancellation. Only once the order has been confirmed as cancelled by a member of our team is this the case. Once an order is in the despatching process, we are then unable to cancel it. We do not take financial responsibility for the cost of the return of any products ordered in error or that are no longer wanted. If this is the case you will be contacted by the carrier advising how to arrange redelivery. Your statutory rights will not be affected. We cannot be held responsible for any costs incurred whilst you are in communication with our team. Kingfisher Medium Garden Storage Tool Cabinet Garage Shed Durable Plastic Shelf. Rowlinson Shiplap Wooden Midi Store Garden Tool Shed Storage Unit Cabinet Lock. Sealey Galvanized Metal Steel Tall Garden Tool Shed GSS1508 1.5 x 0.8 x 1.9m. Sealey Galvanized Metal Steel Tool Garden Bike Shed GSS150815G 1.5 x 0.8 x 1.5m. Rowlinson Shiplap Wooden Mini Store Garden Tool Shed Storage Unit Cabinet. 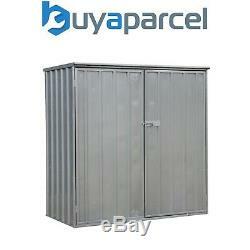 Sealey Galvanized Metal Steel Large Garden Tool Shed GSS2323 2.3 x 2.3 x 2m. Zest 4 Leisure Wooden Log Wood Firewood & Tool Store Garden Storage Shed FSC. Sealey Galvanized Metal Steel Large Garden Tool Shed GSS2323G 2.3 x 2.3 x 2m. SIGN UP TO OUR NEWSLETTER. Stay up to date with our special offers & promotions. The item "Sealey Galvanized Metal Steel Tool Garden Bike Shed GSS150815 1.5 x 0.8 x 1.5mtr" is in sale since Wednesday, March 15, 2017. This item is in the category "Garden & Patio\Garden Structures & Shade\Garden Sheds". The seller is "buyaparcel-store" and is located in GB.